My Meyer lemon tree produced a whopping 5 lemons this year. Sad, but better than last year's 2. Container citrus culture is not producing the harvest I'd hoped for. Nevertheless, we have a good assortment of organic citrus at the local stores these days, and lemons, oranges, and grapefruit are piled high in the fruit bowl ready for a quick snack or adding to tea or a recipe. Honey and lemon is a tried and true remedy that most everyone is familiar with. A cup of hot tea laden with honey and lemon juice is a quick fix for a scratchy throat. Today I visited a friend and she showed me her latest 'recipe'- Lemon Slices in Honey. Simply thinly sliced lemons suspended in a jar of honey. She had this in the refrigerator to infuse. This sounds like a great way to preserve my lemon harvest, and will be handy for when Lemon & Honey tea is ordered. 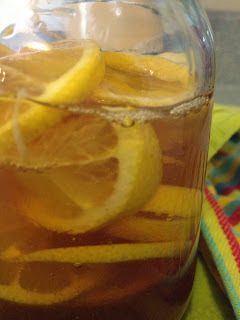 Have you ever preserved lemon slices in honey? How else do you use lemon in your household?